Evening Loverlies!! To be honest I didn't really know what to blog about today. But I wanted to make sure I got in a blog post today, since it is the week. I decided to grab my Bible book and noticed my lil birdy book of quotes. I've failed in filling this full. But I still have time eh? lol I decided I would share with y'all a few of my quotes I have in this lil quote book of mine. Some of them are scriptures and a few actually are about blessings. Which is perfect for this month because, this month Thanksgiving happens!! First off I want to say what blessings I am thankful for. I am thankful for God giving me my husband Codey in my life. We have our ups and downs like any marriage. But he has been the only one that has understood my anxiety and depression, and has been there through it all with me. He is still here sticking through my rough patches with me. And I am very thankful I have him in my life. The second two little things that I am thankful for are my two male kitty cats, Zealand and Granger. They have helped me through a lot also. They are always there when I just need someone to cuddle with. They may not be children to anyone else, but they are my children in my eyes. The third thing I am thankful for are my In laws. Yes, you think what??? In laws are nice!!! Yes, my in laws are my family and are there for me. So I am thankful they are in my life. Fourth thing I am thankful for are my friends that I do have. I only have a few, and most of them are online. But I think of them as my family also. And I am glad they are there for me to talk to when I need help or just the good company. The fifth but not final, thing I am thankful for is that I have God in my life. That I am not where I was a few years ago at least with my anxiety and depression. That I am able to see a bit more clearer and that I am trying to overcome the anxiety and depression. And I probably wouldn't have gotten this far if God wasn't there with me. Alrighty on with the quotes!! Ta Ta For Now!! "When we lose one blessing, another is often most unexpectedly given in its place." "Sometimes God makes better choices for us than we could have ever made for ourselves." 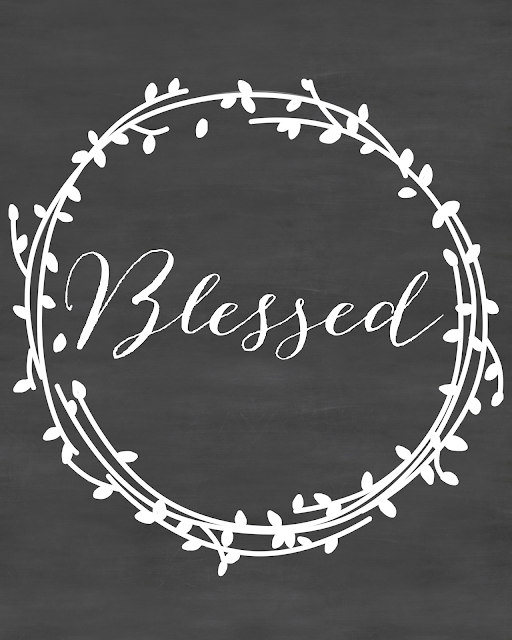 "God doesn't bless us just to make us happy; He blesses us to make us a blessing." "If we never experience the chill of a dark winter, it is very unlikely that we will ever cherish the warmth of a bright summer's day. Nothing stimulates our appetite for the simple joys of life more then the starvation caused by sadness or desperation. In order to complete our amazing life journey successfully, it is vital that we turn each and every dark tear into a pearl of wisdom, and find the blessing in every curse." This Loverly picture I found on a blog called Three In Three!! Click this to check it out! !